I've been wanting to document the story of Khayla's potty training because in no time at all, I'll be potty-training Khadeeja for all I know! Seriously, these kids grow up too fast. One minute Khadeeja is just a wrinkled, day-old baby and now she's rolling on the mattress and turning herself from back to front! Sob, sob… I wish I could freeze time and spend more time with their baby selves, you Moms out there know what I mean right? Ok. So back to potty-training journey. Before I gave birth to Khadeeja, we found out that Khayla's awesome nursery is closing shop and suddenly, we are back to square one - taska shopping! I tell you, this is one task that I hate to do because it involves major transition and nerve-wrecking, trust/relationship-building all over again. What if Khayla can't fit in? What if she cries every day? What if the new place is not as good as the old ones? Eh, eh, why am I writing about taska-shopping pulak? Anyway, soon we found the best school in Sri Gombak to send our 2-year old daughter. The moment I stepped into the school, I just love the environment, the syllabus, the friendly kids of which some attended Khayla's previous nursery so she won't be too lonely after losing her one and only best friend. The only problem is - okay there are two problems. One, she was not 2 and a half years old yet. She just turned two. The school only admits 2 1/2 year old kids to 6 years old for some developmental milestones reasons and because their concept is not a nursery but a kindergarten. Two, because she wasn't potty-trained yet. We are back on the potty-training story. Yeay! It was then I decided that she should start to be potty-trained so that she could try out at the school because developmental wise, I'm confident my Khayla is quite an independent spirit. She just needs to lose the diaper and she's as good as any 2 1/2 year old kids. Hehe. The moment I got back from my maternity leave in Bintulu, we straightaway got down to the potty-training task. WARNING: 'Accidents' WILL happen during this process. My friend warned me to put away carpet and put water-proof layer on my sofa which I didn't heed (and later regretted). Always ensure mop is available and plenty of rags to wipe up the pool of urine! Occasionally, you might also need kitchen towel to pick up faeces. So make sure you put your kid on a regular diet and NOT introduce something that might IRRITATE his/her tummy during this process! TIPS: When can you start potty-training? Studies show that starting too young is not really beneficial (except it saves you on diapers, probably?) because kids will learn to control their bladder / bowel movement around 18months or as early as 15 months old. Therefore, even though you start training them at few months old, they will only master the skill at around 18months old and maybe even later. Another suggestion is to start potty-training once the baby/toddler could communicate to you of her/his need to go to the toilet. The purpose of wearing training pant is to avoid accidents but at the same time the waterproof layer makes the toddler feel wetness on her bum area. Bambinomio has these pants in various cute colours :) For more info, go to Bambinomio.com to check out the details. I thought of potty-training Khayla ever since she turned one so I bought a potty seat, you know the one that you just put over the toilet seat so that kids will not fall into the toilet while using it. But then I fell pregnant with Khadeeja and just didn't have the energy to potty-train a toddler with my constantly sick condition. Why I bought this? First of all, it's less than RM10. And the practical me thought - let's skip the whole potty chair thing-y and get her used to using the real toilet because I don't have to clean up the potty after she does her business. Ladies & gentlemen, that is one dumb thought. Most toddlers find it terrifying to sit on a toilet for the first time because they feel like they will fall into the toilet bowl. My Khayla is no exception. 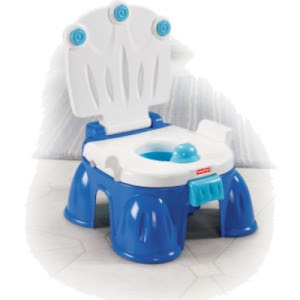 So I bought a potty chair that resembles the toilet for her to use. She thought it was great fun lifting up the lid, sitting on it and then pretending to flush it for the first few days. Oh yeah? How did she figure out the whole steps? Through observations, of course. There's no such thing as privacy when you become a parent! This is the second most tiring part after wiping and mopping urine off the floor. Basically every 30 minutes I had to call her and bring her to sit on the potty chair whether she really wants to go or not. I will stand by the door making 'sheee-ing' sounds while she gave bewildered stare at me. This lasted between 10-15 minutes and then she was free to step out. The next minute I knew, she made this sound, 'Ahhh… Shee-shee…' and I have a pool of urine to clean up! Step #4: Free, free as a bird! With cloth diaper and training pants are not producing any exciting behaviour modification just yet, so I decided to heed a few people's advice of letting her loose without any diapers. Just shorts, or even in just her t-shirt sometimes. The first few days were nightmares - I was screaming non-stop whenever she had her 'accidents' on the carpet / sofa / bed / floor. Especially on the carpet! I know it's not her fault for not telling because she's still not used to it, but I couldn't help ranting at her for making me wipe the carpet / floor / change sheets / etc.! This continued on for the next 3 days. By the 4th day, she was kind enough to let me know by saying, 'Ahhh… Shee-shee!' while she had her 'accidents'. So I ranted at her again ('Why must you tell me AFTER you have done it???') for the next 2-3 days. By the 2nd week, somehow it got through her mind that she must tell me before she went, so she said, 'Shee-shee?' and off we sprinted to the toilet together, me cheering her on and giving praises for her thoughtfulness! Talk about positive and negative reinforcement! Since Khayla loves to imitate my actions and loves feeling like a grown-up, so I let her empty her potty after she has had a go, then flush the toilet. This is the part that she loves doing the most and thankfully, she has gone through the transition from diaper to potty within just 2 weeks without much fuss (and lots of exercise for me of course). In fact, she became so used to being clean and dry all day that she even refused to wet her diaper pant when we go out, but instead will make a noise that will escalate to frantic noises if she has to go to the toilet! Sometimes at night, she also wakes us up to go to the loo. It was kind of amusing at first, but now we look back in nostalgia at those times when we had a good night sleep! Khayla also became confident enough to use the toilet itself whenever she has to do No. 2, much to my relief. She learnt to rest her feet on the potty chair lid so having the potty chair was a blessing indeed. So there it is. Khayla's potty-training journey. I hope that Khadeeja's journey will be as smooth and turbulent-free as this one! Thanx Karni..share ur exprnce. Aku pun tengah nak potty train Aisy. Ko kene bertabah dalam 2 minggu… make sure ko simpan toto sumer. anak ko dah 3 tahun, mesti dia lagi cepat faham drp si khayla, hopefully lagi cepat belajar :) tak yah pakai training pants pun takpe. Khayla pegi tadika kat area rumah aku je. Aku tak sure la tadika lain accept ke budak still pakai pampers tapi tadika yg ni mmg syarat dia budak tu dah pandai pegi toilet. Tu yg aku gigih ajar si Khayla tu pegi toilet. Alhamdulillah skrg dia tido jarang2 dia kencing dlm seluar. Mmg Aisy dh ok sbnrnya. Dia leh cakap nak shee then terus pergi bilik air. Cuma yg buat aku tak suka bukan apa, dia kata nak shee, tapi bila masuk bilik air je dia main air. Bukan nak shee pun. Lepas tu nak mandi then tukar baju lain..
Sekarang lak sindrom malas nak ke toilet bila layan tab. Tu dia mintak pakai diapers. Kat nursery pun dia punya penjaga tak gigih macam dulu ajar dia ke toilet. Tu yang aku ingat nak tukar kndrgrtn je. Biar dia jadi rjn sikit. Mlm macamana? Khayla bangun atau pakaikan diapers utk dia? Aku sll gak check diapers Aisy, bila siang memang dia tak banyak kencing pun. Tapi malam memang diapers dia akan penuh kalau nak tukar pagi tu. Masa aku training si Khayla ni, aku admit mmg aku garang gak la ngan dia. Dia kencing kat lantai, aku marah n bebel2 kat dia smb aku mop lantai. Dia kencing kat karpet, haaammbikkk kau aku smp jerit kat dia! Lepas 2 kali dia buat, dia sendiri cepat2 lari taknak pijak karpet klu dia terkencing punya la takut kene jerit ngan mak dia. Ada satu masa awal2 tu, dia pun naik fed up gak aku asyik suruh gi toilet padahal dia taknak gi pun. So dia mintak aku pasangkan diapers. Tapi aku taknak. Tau2 dia pasangkan sendiri, terbalik plak tu tapi mmg dia gigih nak pakai jgk diapers. Pastu aku sorokkan stok diapers dia hahahaha!